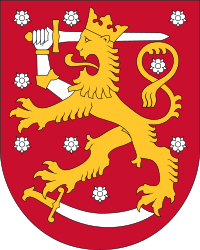 The Coat o airms o Finland is a crouned lion on a reid field, the richt forepaw replaced wi an armoured haund brandishin a sword, tramplin on a saber wi the hindpaws. Offeecial anerlie syne 1978, the coat o airms wis oreeginally creatit aroond the year 1580. The heraldic lion is quite common in Wastren Europe, an several European kintras incorporate it intae thair naitional coats o airms. In Nordic heraldry, the lion is first-foond in the coat o airms o Denmark in the later pairt o the 12t century. Stairtin in the 12t century, the territory o the day's Finland wis gradually incorporated intae the Swadish kinrick, an this coincidit wi the period when coats o airms first came intae uise in northren Europe. The first kent uise o the lion in Swaden wis on the ryal seals o Erik Knutsson (dee'd 1216) an Erik Eriksson (1216–50), who uised twa an three lions on thair seal, respectively. The first keeng o the Folkunga faimily, Valdemar Birgersson (1239–1302), an aa uised 3 lions on his seal (Figure 2). Bengt Birgersson, the first Duke o Finland (1254–91, Duke frae 1284 till 1291), an Valdemar Magnusson, the seicont Duke (dee'd 1318, Duke o Finland frae 1302 till 1317), baith uised the later Folkunga coat o airms, which wis a crouned lion rampant wi three bends sinister, the main difference bein that Valdemar's airms haed the field strewn wi herts (Figure 3). This version o the airms wis quite seemilar tae the modren coat o airms o Finland, but the lion did no yet brandish ony wappen. Wikimedia Commons haes media relatit tae Coats of arms of Finland. This page wis last eeditit on 16 Februar 2018, at 00:46.